This Is Us, which is centered around the Pearson family, has received nominations from The Critics Choice Awards, AFI, NAACP, and won the People's Choice Award for "Favorite New Drama" and the SAG award for "Outstanding Performance in a Drama Series." Metz plays one of the three Pearson kids, Kate, and it was a character that had never been seen on television, a woman struggling with her weight, eating habits, and body image, and viewers can relate to her, no matter what they look like or where they come from. 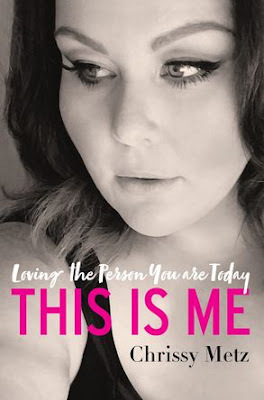 In her new book, This Is Me: Loving the Person you are Today, Metz shares her story with a raw honesty that is surprising and also inspired. Infused with the same authenticity she brings to her starring role on This Is Us, Metz's memoir is so much more than your standard Hollywood collection of personal essays. Metz embraces the spirit of Shonda Rhimes' Year of Yes, and shares how she has applied the lessons she learned from both setbacks and successes. Metz finds light in even her darkest moments, and leaves the reader feeling they are spending time with a friend who gets it. Metz writes This Is Me in a very conversational tone, such as when she writes about what she has taken from working on This Is Us, "What I've learned from the show is that there are so many ways we can connect if we are willing to be vulnerable. Sharing the things that we're afraid will make us appear less in others' eyes makes us stronger. Because confidence is really trust in yourself, right? It has nothing to do with what someone else thinks of you; it's what you think of you. And as we collectively share our truths, I believe we are placing deposits into our own confidence bank. Not only does sharing your truth help other people, but then you feel good and come to realize your value. When you then build on that value and continue to be a positive person, you can be a light for others in getting out of their own way." 1. How could all this have felt so normal? 2. I really need to wash my car. 3. I had dreamed this lunch into reality. "Marty and I had lunch at Giovanni's, a little pizzeria on Coast Village Road. I knew Oprah's famous Montecito estate was very close, and as I sat that table, I thought, I'm going to meet Oprah one day and live next door to her. So, I said just that, out loud, in a joking way. 'I want to be in Montecito someday, hanging out with Oprah.' My wish came true because I put it out there. I truly believe that the things you want can happen, but it starts with asking. "Because honestly, I am someone who is still incredibly flattered that anyone knows my name, let alone Oprah. People ask me what the most surprising thing is about my life recently, and of course that lunch flashes in front of me. But it's all of it. "As a teenager, I was the girl sitting on the couch in Gainesville, watching Oprah because I didn't have a real mentor. In Los Angeles, I would watch The Hollywood Reporter actress roundtables with my friends because we couldn't afford acting lessons. I know firsthand that it's never too late for you and it doesn't matter what you look like. The universe responds when you really pursue your heart's desire." Metz is also known for roles in American Horror Story: Freak Show, Loveless in Los Angeles, Solving Charlie, My Name is Earl, and Entourage. She hails from Homestead, Florida and grew up in a large family that always seemed to be moving and growing. The middle child of five siblings, she took the spotlight as the 'entertaining diplomat' of the family. She moved to Japan as an infant and lived there for nine years before moving back to the U.S. Her father then disappeared one day, leaving her mother to work a series of menial jobs and his children to learn to live with the threat of hunger and the electricity being cut off. When her mother remarried, Metz's hopes for "normal" were dashed when she experienced a form of mental pain that seemed made just for her. The boys who showed her attention always did do with strings attached, and she accepted it because to her, love always came with conditions. Metz was discovered in Gainesville at a local talent event that she originally attended as a chaperone for her sister, and she then packed up and moved to Los Angeles to find her way into entertainment. It was the first time she had been away from her family and Florida, and for years, she barely got an audition. The heart of This Is Me comes from how a woman that had the deck stacked against her radiates love, beauty, and joy. Metz mixes in autobiographical stories with instructional ones, giving practical applications of her hard-won insights in a series she calls "Bee Mindful." This is where she invites the reader to express gratitude in "Say Thank You" or to be honest with your partner and yourself in "The Shrouded Supreme. Blending love with her experiences, Metz encourages us all to claim our rightful place in a world that may be trying to knock us down, find our own unique gifts, and pursue our dreams. In a case of life imitating art, Metz' real-life story is just as inspiring as the show she stars on every week. Once you read this book, you will appreciate her performance even more.